'Peace Is A Choice,' Trump Says During Appearance With Palestinian Leader : The Two-Way The president provided few specifics about how a deal might be achieved in a peace process that has been stalled for years. He said it could "begin a process of peace all throughout the Middle East." 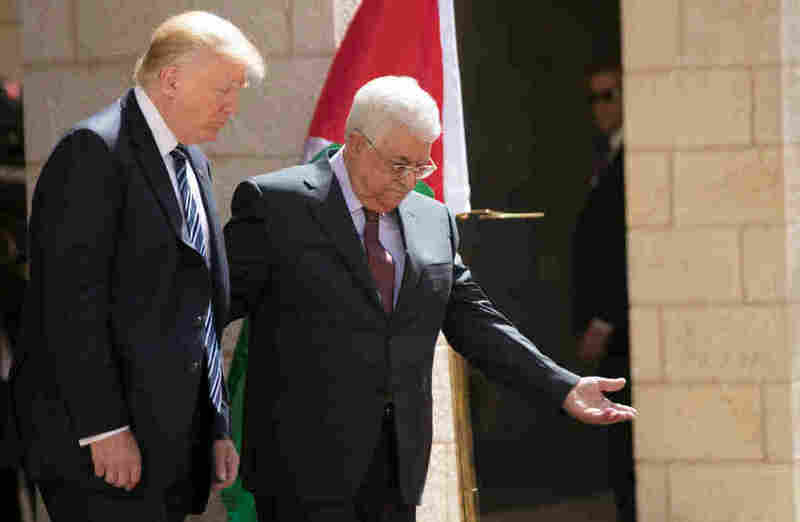 President Trump and Palestinian Authority President Mahmoud Abbas participate in a welcome ceremony Tuesday at the Presidential Palace in the West Bank city of Bethlehem. "Peace is a choice we must make each day," President Trump said during a visit to the West Bank city of Bethlehem, where he reiterated his resolve to help mediate a peace deal between the Israelis and the Palestinians and sounded upbeat about its prospects. "The United States is here to help make that dream possible for young Jewish, Christian and Muslim children across the region," Trump said Tuesday as he stood alongside Palestinian Authority President Mahmoud Abbas. Trump also expressed an even loftier hope than an Israeli-Palestinian peace agreement: "I also firmly believe that if Israel and the Palestinians can make peace, it will begin a process of peace all throughout the Middle East, and that would be an amazing accomplishment." "He's looking for a kind of outside-in approach, first peace between Israel and Sunni Arab states, who have a common enemy in Iran, and that regional peace leading to Israeli-Palestinian peace. So Trump is, in those remarks, kind of putting Israeli-Palestinian peace kind of in the center of the agenda." Trump provided few specifics about how a deal might be achieved in a peace process that has been stalled for years. "The president notably avoided all of the thorny issues that have stymied peace efforts for decades," The Associated Press noted. "He did not weigh in Israeli settlements, the status of Jerusalem or even whether the U.S. would continue to insist on a two-state solution giving the Palestinians sovereign territory." Abbas emphasized that he was committed to cooperating with Trump to forge a deal. "The conflict is not between religions," Abbas said. "Our fundamental problem is with the occupation and settlements." As Daniel pointed out, Trump came face-to-face with a major symbol of Israel's occupation during his journey to Bethlehem this morning "when his motorcade sped through a gap in the Israeli separation barrier that separates Israel from the West Bank. Around Bethlehem, it's a tall concrete wall covered in graffiti. ... Palestinians in Bethlehem say they feel like they're living in a ghetto with it." Trump has repeatedly underscored U.S. support for Israel during his first international trip as president. He met multiple times with Netanyahu and said in a joint appearance with the prime minister Tuesday, "I can tell you that the Palestinians are ready to reach for peace — and, from my meeting with my friend Benjamin Netanyahu, I can tell you Israelis are ready to reach for peace as well." Netanyahu's tone was somewhat less upbeat, with sharp criticism for Abbas. He said that while Abbas condemned Monday's attack in Manchester, "if [the attacker] had been Palestinian, the murderer's family would have gotten a payment. That law must end." As Daniel notes, the Israeli leader was referring to "what Palestinians see as a form of welfare support to families whose relatives have acted on behalf of the Palestinian cause." Trump visited the Israel Museum and the Yad Vashem Holocaust remembrance center on Tuesday and now heads to Italy and later is expected to meet with Pope Francis. Earlier in the trip, he traveled to Saudi Arabia, where he delivered a speech to dozens of leaders from Muslim-majority nations.